The Automobile Service Co Guide to Buying a Used Vehicle - Automobile Service Co.
Used vehicles are certainly an economical choice for budget-conscious St Louis Park drivers. But how can we know we're getting a good used vehicle and not just inheriting someone else's problems? There are good used vehicles for sale in the Minneapolis area. Cars are sold when families upsize, when families downsize or even when someone just wants a new car. So the used vehicle may be just fine. But some St Louis Park used car owners sell vehicles because they don't want to deal with developing or existing problems. When you're considering buying a used vehicle in St Louis Park, ask for service records. Check to see if the recommended schedules for preventive maintenance have been followed. If so, you probably have a great used vehicle on your hands. If there aren't any service records, then assume the worst. If the used vehicle you're looking at is a late model vehicle with under 35,000 miles, or 55,000 kilometers, on it, take it to Automobile Service Co for a full-service oil change. This inspection will reveal many basic or developing problems. Talk to your friendly and knowledgeable Automobile Service Co service advisor about concerns you had on the test drive. Get a heads-up on needed repairs or maintenance. Previously leased vehicles are often tempting to used vehicle buyers because they are generally newer models with low mileage and have been factory-cleaned. Be cautious, however. Many St Louis Park drivers of lease vehicles don't bother with preventive maintenance because they know they'll be turning the vehicles in. Again, ask for maintenance records, take the vehicle in for a full-service oil change and consult with your friendly and knowledgeable pros at Automobile Service Co about any problems the vehicle may have. Older used vehicles are even more problematic for St Louis Park used car buyers. Older vehicles simply come with more maintenance and repair issues than new ones. 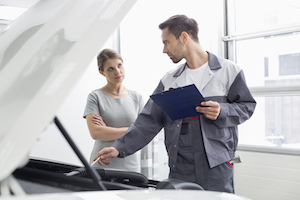 Take these vehicles in for a used vehicle inspection at Automobile Service Co. Usually, a seller will let you do this before you purchase the vehicle. These inspections are very thorough and will help you know what you're getting into. You'll be able to make an informed decision about your purchase. That peace of mind will make the cost of the inspection more than worth your while. It's always good auto advice for St Louis Park drivers to purchase a Carfax report on any used vehicle. This report will let you know if the vehicle has been in a major accident and will give you a title history. You'd be surprised what used vehicle buyers have learned from those reports. Know before you buy. Once you purchase a used vehicle, give it some tender loving car care. Give it a thorough cleaning, inside and out — and don't forget the engine compartment. A good wax will make it look and feel “new.” And, of course, stay on top of preventive maintenance. Used vehicles bought in MN can last a good, long time if they're properly cared for. They're economical to buy, and they can keep on saving us St Louis Park drivers money if we look after them.